We all love Multi-purpose products, the one in spotlight also claimed so: Does Luscious Ultra UV Whitening Base (old version) proved it's claim or not... To Know More Read More!!! Sun damage has become a big part of our lives due to pollution and the environment. No matter what your age is, you are at risk of sun damage (dark patches and uneven skin tone) every time you step out without a good sun block. Here to the rescue is Luscious Whitening Base SPF 35. The benefits: The list is endless. With continued use, you will see a visibly clearer and fairer complexion, as well as smoother skin texture. Your makeup will go on more smoothly and last longer. Apply all over your face and neck at least 15 minutes before you go out in sunlight. 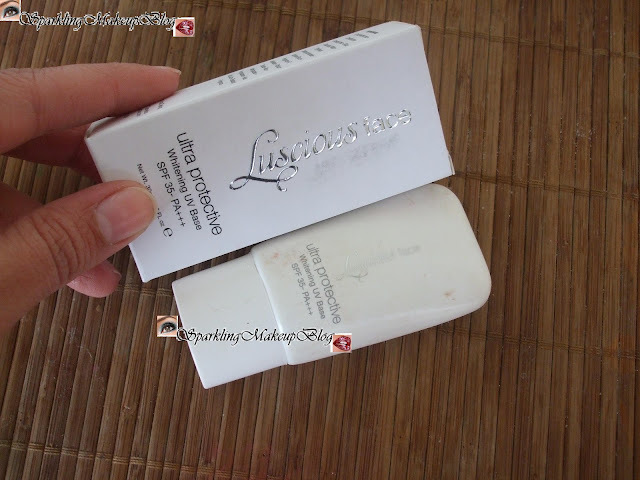 Use it alone or before applying foundation or face powder. The right balance of sunscreens helps protect your skin from harmful UVA/UVB rays-without irritating your skin. Contains light reflectors for a glowing, radiant complexion. The formula is perfect for our region and climate. Sun Protection Factor (SPF) 35 is the ideal recommended by dermatologists for our skin. It came in a white box with silver inscriptions, the tube was in round shape in hard plastic. White cap and a nozzle in a squeezable plastic tube. It looked small. Net wt. 30 ml. I am sure if you have been following my previous posts in this My Luscious Collection Blog Series, then I don't have to Brag about my love for this Pakistani brand named Luscious Cosmetics. 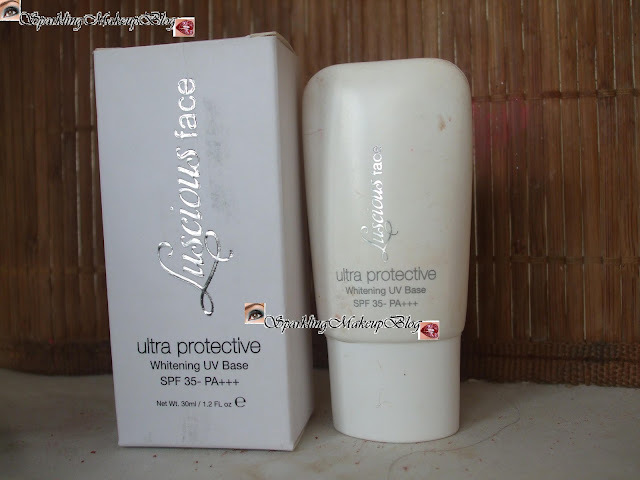 When I bought this Whitening UV base I was ignorant even to the word "FACE PRIMER" (shy!0-o). As I was not a foundation person before my wedding, earlier I was using Olay white Fluid in place of any foundation as a base and then dabbed over it with my E'tude 2in1 compact and TADA!!! I was ready for any occasion either be a wedding, festival or any casual or formal function (I still suggest this simple base for students and young girls). I am not sure they had fakes in the market or just something happened to the quality of OLAY white fluid, the one I bought for using after my wedding irritated my skin badly, so left it immediately. 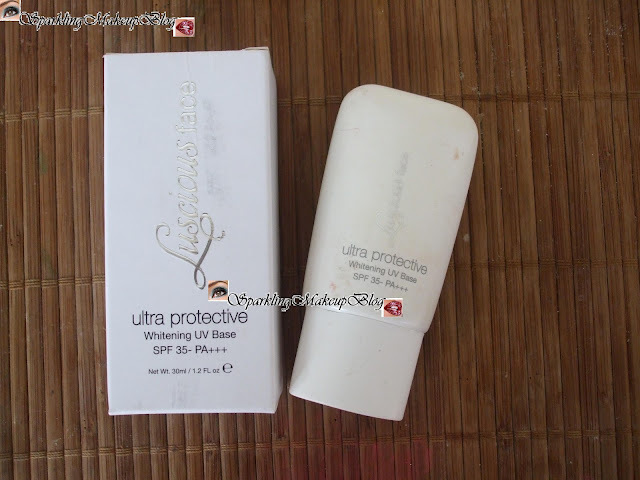 It was then I spotted this WHITENING BASE, and believe you me I was not disappointed by this one although it was expensive then Olay and the quantity was even less too but still it was not irritant at all and copped with my shiny oily skin very well and proved a good companion for my E'tude 2in1 compact. As per the claims: Yes it is oil-free, did not use it much in SUN so can't say about it's Sun Protection claim, hmm and in Summer this old version proved a good primer for me under my compact powder. As it clearly says it is WHITENING and it is, so I prefer not using it under my liquid foundation as it tends to change the colour of the foundation on my skin and as I am fair complexioned person I do not want to look white-washed. It has a shimmer, they call reflectors, in it which makes the face glow. It gives full coverage. I am not a Sun-block person as they make my skin sweat more and thus I end up shining like being oiled on face, but this one amazed me as it claimed to be a Sun-protector but did not give me a single drop of sweat on my face and my face stays matte for handsome amount of hours. The only negative is that this older version tends to dry the skin in winter thus making the dry patches and flakes prominent on my skin. May be it is matte so it is good for oily skin. Now they have come up with two types one for Oily skin and other for Normal to Dry skin so that may be a help to choose according your own skin type. I haven't used the New version yet so can't say anything about those. As Winters here so it is now resting in my drawer and in Summers when I do not use any foundations for casual going-outs I apply this and Dabb my compact powder over it and I am more than ready to face the Summers. 4/5. If only it would have been as good in Winters for me as it is in Summers. I can recommend the older version only as I haven't used the new one yet but still think that it being dealing with two different types of skin may make it more perfect than this one. It costs Pkr 975 each. Available in all the stores having Luscious Cosmetics counter Nation wide (Pakistan). The Newer Version for Oily skin and Normal to dry skin can be bought online from there website HERE!!! Do join Luscious Cosmetics Facebook Fanpage to stay updated with this brand. To read my reviews on my Luscious Collection Click HERE!!! Hope you like this post. Do comment share, like, tweet, PIN it & G+ this post to spread the love of Luscious Cosmetics around. It seems good but only one option is not good for me and that it dries the skin.